Is Nikon’s budget J1 Compact System Camera worth the wait? At one time it was considered that if you wanted the best photo quality and lightning fast response times you bought a digital SLR. Now that is only partly true. 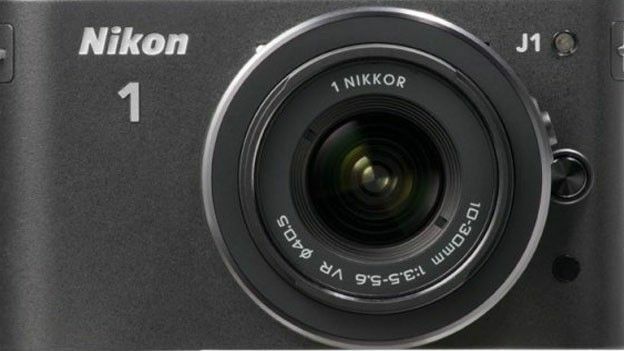 Nikon's new 10.1 megapixel J1 compact system camera (or 'CSC') is the slightly less expensive, more consumer friendly alternative to its flagship Nikon V1, with a rounded edged body shape roughly a quarter smaller chiefly due to it omitting the Nikon V1's electronic viewfinder. This has enabled its maker to lay claim to the world's smallest camera with a sensor size larger than one inch. The bigger the sensor the better the picture quality runs the accepted patter. Again the J1's design is minimalist from the front and top, with neatly sunken controls including pop up flash unit that extends straight upwards at the flick of a catch and needs to be pressed back down when finished. The L-shaped flash looks slightly odd when erect: like a robot's toothbrush, although this does further distance it from the lens so there's less chance of the dreaded red eye effect in portraits. Flash aside, backplate buttons and their positioning are identical to the V1, just shoehorned into a slightly smaller space. Like the V1 the J1 is an interchangeable lens camera, so Nikon provided us with a twin lens kit, pairing the lighter body with a 10-30mm standard zoom plus a longer and slightly larger 30-110mm telephoto zoom. With a 2.7x sensor magnification factor making them the 35mm equivalent of a wide angle 27-81mm and telephoto 81-297mm respectively, together a broad range of framing options are provided and the set up will be arguably all a keen amateur photographer or at least happy snapper with loftier pretensions could need. Again though, and as with buying the bulkier alternative of a digital SLR, purchasing a Nikon CSC is an investment rather than an impulse purchase; our J1 review dual lens bundle is priced at £699.99. That's on a par with a mid range DSLR. If you'd needed an indication that Nikon was playing the 'style' card with the J1 that is provided by the fact that the top plate controls are, with the exception of the marginally raised shutter release button, even more recessed into the bodywork than on the V1. We still get a dedicated video record button, and here the welcome addiction of the pop up flash. Controls to the rear are even more a carbon copy of the V1. So we again get a four option shooting mode dial, dedicated display, playback, menu and delete buttons, plus four-way command pad encircled by a scroll wheel to speed up menu selection. Likewise, as on the V1, the mode dial shows just four basic options governing stills and video, with the more expansive likes of Program, Aperture Priority, Shutter priority, manual and scene modes squirreled away within the on-screen menu options. While that's fine if all you want to do is point and shoot – and that's primarily what the J1 is for – more experienced users may feel frustration that such options aren't literally at their fingertips and aren't included on the mode dial itself. Still, Nikon has chosen an initially less daunting user interface instead. Although the J1's fixed, non angle adjustable screen is as large as the V1's, in spite of the overall smaller body proportions, it offers roughly half the resolution at a still very respectable 460k pixels. And in use we didn't notice a pronounced difference between the two cameras. The J1's screen's visibility was more than adequate even though we were shooting in bright autumnal sun. Just as well, as in such circumstances we don't get the fallback option of shooting with an electronic viewfinder as we do with the pricier V1. Incidentally the J1 also misses out on the V1's accessory port, so we don't have the option to add an external microphone, flashgun or GPS unit either. Mind you the J1 is £280 less than the V1 with the same lens set up we were testing – for which you could buy an additional snapshot camera! Like the high end V1 model the J1 claims to be faster than many professional cameras, thanks in part to new Expeed 3 image processor. This enables it to process pictures at up to 600 megapixels per second, so while it might be argued that nearest rivals are already quick enough, with the J1 there's barely time to blink. It also allows a full resolution shot to be taken whilst video recording, plus maximum resolution stills to be captured at up to 60fps. Again, this is the same spec as the V1. The J1 offers an expandable light sensitivity range between ISO100 and ISO6400, Raw shooting and the rather unique ability for the camera to automatically switch between Phase Detection or Contrast Detect auto focus (AF) based on subject matter. Most cameras choose one or the other AF system and have nowhere near as many focus points – with user choice here of a whopping 135, or a still massive 41 points deployed automatically – the advantage being that subjects should be sharp no matter which miniscule speck of the frame they're located in. That's if, of course, camera shake can be avoided when shooting with the longer lenses on test, for which you'll need not only the relevant optical technology deployed but a steady hand to avoid blur. It's also worth mentioning that before you can start shooting with either provided zoom they have to be first manually extended, as each features a retractable mechanism to keep them as compact as possible in transportation mode. This unfurling is done with a press of a large button on the rubberised zoom ring and a twist of the wrist. The alternative is to go for the non-extending ultra compact 10mm fixed focal length lens kit at £599.99 if you really do want to be up and shooting from scratch as quickly as possible. The Nikon J1 comes supplied with a smaller battery than the V1 in the EN-EL20, with mains charger and UK plug adapter provided in the box. This provides up to 70 mins of Full HD video or 230 images from a full charge, so considerably less than the 400 shots that can be squeezed from the V1 with its larger battery. In fact 230 pictures is on a par with the average point and shoot compact that the J1 offers a step up from, so arguably its more mass market user base isn't going to be grumbling. Enthusiasts may beg to differ however. Just as Nikon DSLRs break from the pack by not featuring body integral image stabilisation – instead relying on lenses with anti shake technology – so too does the J1 body. And so both lenses with our review sample came 'VR' (Vibration Reduction) equipped. Even so, shooting handheld we did get more than our fair share of soft shots in seemingly perfect daylight conditions, particularly at maximum zoom (nigh 300mm equiv.) setting on the 30-110mm, which was disappointing. Colours are also a little muted on JPEGs straight out of the camera, a look shared with the Coolpix camera range, though manual tweaking in-camera and shifting from default Standard to Vivid colour mode is possible. Like the V1 the J1 offers Full HD video shooting at 1920x1080 pixels and frame rates of 30fps or 60fps, and with the unexpected bonus here of stereo sound. Any focus adjustment as the user manually zooms in is handled so deftly it's almost unnoticeable, so we didn't get the shot going momentarily soft as usually happens with manual zooms. You do have to physically turn the mode dial to the video option and then press the camcorder style record button before filming will commence however; it doesn't instantly 'cut in' no matter which other mode is in use. As Nikon's (joint) first interchangeable lens compact, and its maker being one of the world's top two photographic brands, there was always going to be interest in its J1. Especially as, unlike the V1, which has been pitched more obviously at enthusiasts by virtue of its additional viewfinder, the J1 is more obviously aimed at a mass market. That being said, a lot of our comments on the J1 can be considered shared with the V1, as the two cameras offer the same sensor, much the same functionality and core resolution. So, since the Nikon V1 has also been rated elsewhere on this site, we've chosen slightly different aspects to highlight here. Please do read both reviews if you want the full picture. In summation, as regards the J1 this is a fun addition to the compact system camera line up, but we can't help feeling the bundled zoom lenses would perform better on the slightly weightier and bulkier V1, and conversely the 10mm lens we had provided with our V1 sample would work best with the J1. They can of course be bought in that alternative configuration if wished. And, if it's simply ease of use and great looking pictures you're after, a close interchangeable lens compact competitor in Panasonic's Lumix DMC-GF3 is also worth close inspection, as is the Olympus E-PL3 and Sony NEX-C3. Fortunately for Nikon it might just have the edge on brand loyalty, but with it entering a new market sector, everything is up for grabs.